The publication of George Orwell’s 1984 in 1949 came with foreboding about the emergence of Big Brother States on the extremes of both sides of the political divide from General Franco’s Spain to Enver Hoxha’s Albania. Older readers might recall the selective targeting of left activists and anti-Vietnam war protesters by our intelligence services during the Cold War era in Australia. More immediate threats to national security from far-right Croatian terrorists were conveniently overlooked (The Guardian Online 29 July 2016). Before his appointment to the High Court in February 1975, the Whitlam Government’s Attorney-General Lionel Murphy (1972-75) noted that ASIO and other Australian intelligence agencies had allowed blind-spots to emerge in their assessment of far-right groups in Australia. The details are covered in Paul Lynch’s article for the Evatt Foundation. Murphy believed ASIO was withholding information on Croatian terrorist organisations. The real reason Murphy raided ASIO, they claim, was to get a hold of his own file. Murphy feared ASIO might have incriminating evidence of links with communists. When he showed up, some say quite intoxicated, he demanded that ASIO produce his file. He was told there was no such file. Not convinced, Murphy apparently thumbed through files looking for anything under “M”. He had also searched index cards at ASIO offices in Canberra and Adelaide. Intelligence agencies have since been subjected to public inquiries by two reports of the Hope Royal Commission and the more recent Flood Inquiry (2004). Former High Court Judge Michael Kirby believed that more accountability is still required from our intelligence networks (Cathy Alexander from Crikey Online 27 May 2014). Former High Court justice (and student politician) Michael Kirby lamented that his file was “disappointingly small”. It started when he was a boy of eight, because his grandmother married a Communist Party member. The man in question took Kirby to the zoo where the file showed “we were recorded near the lion’s den”, Kirby told the audience gravely. But jokes aside, he said the book showed ASIO’s surveillance of people “went far beyond what was proportional”. Yes, Australia needs a security agency, but there should be strong checks on surveillance, Kirby argued. And he said Edward Snowden’s revelations about the use security agencies made of IT to watch people compounded the issue. In August, the Coalition released the telecommunications access and assistance bill, which gives law enforcement agencies new powers to deal with the rising use of encryption to keep electronic communications secret. Sensing the heightened possibility of a change of government in Canberra in a few weeks, one parliamentary insider noted that our intelligence services are becoming more even-handed in accordance with their legislated real national responsibilities. This inclusive relationship with intelligence networks would be a welcome part of consensus-building on cybersecurity and electronic surveillance. The political persuasions of decision-making by the Parliamentary Joint Committee on Intelligence and Security is protected by recurrent information blocks like this Gilbert and Sullivan style directive. A drift towards greater openness might be in the wind as intelligence services prepare for a change of government in Australia. The text of an address by the Australian Signals Division (ASD) Director-General, Mike Burgess to the Lowy Institute in Sydney on 28 March 2019 was transmitted online on the ASD site. This address talks up the even-handed professionalism of the ASD in offensive cyber-operations against Daesh in the Middle East. This would, of course, be welcome news to mainstream politics in Australia. Under this Government, 12 terrorists have lost their Australian citizenship. During the last Labor period of Government – no one – not one – person lost their citizenship for any reason. This is another crucial test for the Leader of the Opposition. Having caved into Labor’s radical Left and agreed to trash the Coalition’s successful border policies, does he support Mr Dreyfus’ constant efforts to thwart legislation that seeks to protect Australia and Australians? If Mr Shorten and Mr Dreyfus want to run the lawyer line to look for some technicality to allow terrorists to remain or return to our country – that is an issue for them. The Morrison Coalition Government will seek to keep them as far from our shores as possible. If Australians are to become more comfortable with the extent of cybersecurity and electronic surveillance in troubled times, a much more even-handed from our political insiders on both sides of politics. There are real challenges from far-right nationalists, corporate eves-dropping, criminal networks and rampant tax evasion which are overlooked in the currently highly charged security environment. Australia’s welfare and security are compromised by the extent of the Black Economy which has been covered in the Final Report of the Black Economy Taskforce from the Australian Treasury dated October 2017. The black economy is not standing still, but rapidly shifting and evolving in step with wider economic, technological and social changes. It is a growing problem which, if not dealt with, can develop a dangerous momentum of its own: a ‘race-to-the-bottom’ which we are already seeing in particular areas. In 2012, the Australian Bureau of Statistics estimated that the black economy equated to 1.5 per cent of GDP, with the illicit drug industry adding a further 0.4 per cent of GDP. This estimate is now outdated. We consider that the black economy could be as large as 3 per cent of GDP (roughly $50 billion) today, given the trends we identify in this Report. A sense of urgency is needed from policymakers, leaving behind business-as-usual approaches from the past. A new strategy and commitment are required: one which addresses underlying causes, not symptoms, while keeping regulatory burdens low; one which goes beyond tax; and one which breaks down agency silos and embraces joint action and the intelligent use of data and analytics. This Taskforce was a genuinely whole-of-government undertaking, bringing together 20 Commonwealth agencies. If Bill Shorten makes it to the Lodge in a few weeks, there is real scope for a more even-handed appraisal of national security and supervision of the corporate databases which are monitoring the Australian population. In researching this article, I made polite inquiries with the RISQ Group in Sydney which boasts an association with Sterling Talent Solutions. The capacity of the multinational RISQ Group to challenge the presumption of innocence by assisting in assessments of new recruits and existing staff members challenges our legal traditions and needs a full parliamentary inquiry so that legislative amendments can be drafted to control future abuses of corporate power. It is just the tip of corporate monitoring networks with multinational connections whose legal status needs thorough investigation. Electronic eves-dropping and systematic data collection are alive and well across the corporate sector from the antics of Facebook and Google to self-proclaimed homespun commercial sites like Ancestry.com with their wide access to government databases. Good reporting is always needed to expose threats to civil liberties in a digital age which might go unnoticed without the resources of the ABC and progressive news analysis sites like the Guardian and the Saturday Paper. The excesses of the regional election results in parts of NSW on 23 March 2019 are in the processes of being rectified in a quite unexpected manner. Here is the new action scenario. In the NSW Legislative Council, One Nation and the SFF have achieved a combined 2.5 quotas (ABC News Online 26 March 2019). This adds to the influence of the two far-right Legislative Councillors who continue their eight-year term from the 2015 election. The NSW state election result has enormous implications for the federal election in NSW, Queensland the NT and WA in mid-May 2019. However, the most recent bomb-shell from Al Jazeera has dashed some of the optimism from One Nation. Political morality has temporarily triumphed over populism and expediency. The criticism of One Nation by Prime Minister Morrison is timely and appropriate. On the wider issues of cybersecurity, electronic surveillance and data collection on just about every aspect of our private and public lives, it’s time to reach out to more even-handed intelligence services for greater protection of Australian sovereignty. The brightness of Australian landscapes, international peace and social justice must triumph over the need for private arsenals of guns and knives to offer illusionary protection for lifestyles and civil liberties at a confusing time for humanity. Ironically, in middle age impressionist artists, Tom Roberts (1856-1931) and Arthur Streeton (1867-1943) served Australia’s military commitment to the Great War (1914-18). Arthur Streeton was indeed the official war artist with the Australian Imperial Force during the last months of warfare in France during 1918. The sombre mood of Streeton’s battle-field paintings should stand as a stark warning to contemporary advocates of shooters rights at home and gun-ho military adventures with the US Global Alliance as advocated by One Nation and other far-right political movements (Art Gallery of NSW showing Mount St. Quentin 1918). Fortunately, the impressionist school is better remembered by the creative works of youth like Arthur Streeton’s Ariadne which was created in 1895 (National Gallery of Australia). Like traditional D grade horror movies, the macabre still has its fascination in mainstream politics. Fear is still an important element to rattle the electorate in very emotionally charged debates which define mainstream politics. Hopefully, One Nation may have overplayed its hand in negotiations with the NRA and with Election 2019 restored as a fair debate between pragmatic policy options rather another soap opera. As a political skeptic I wonder whether James Ashby’s Only Nutters Party has read how the Nazis used the census data from 1937(?) to round up all the jewish persons in Austria after the Nazi Anschluss. There are too many possibilities for these nutters to use the Benito Duddo inspired fear-based war mongering legislation to protect the incompetent and keep them in the positions of power and financial privilege that they desire and will fight to insure they retain. You didn’t mention anything about the constitutional changes made since 1973 without the informed consent of the Australian people. The Australia Act 1986 changed the Australian landscape and the Australian Government so that the focus now is on protecting corporations and assets instead of the Australian men and women. Maybe a new Labor Government can begin to undo the damage from these changes made by former Labor and LNP governments? For example, under the Commonwealth of Australia constitution 1901, up to 1973, political groups (parties) with more than 25 people were unlawful. Perhaps that is another reason why the next generation is voting for the minority parties and independents. Progressive Australians have nothing to fear from even-handed intelligence services. 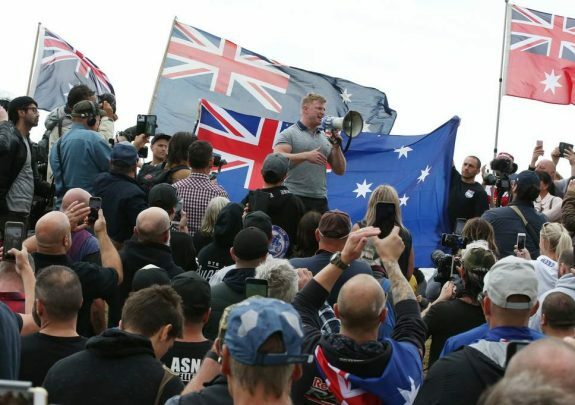 Perhaps they are rightly aghast at the antics of the Australian far-right as suggested in Denis’ article. Timely article Denis, hopefully One Nation has been exposed for the dangers they represent to all Australians, let alone the damage they cause to our image overseas. The NSW elections were a triumph for populism over real policy debate. Denis, thanks for an interesting article. Very topical at the moment. Great article on a very serious issue in society! These extreme groups of the right and left target the emotion of fear! Fear is the worst emotion you can grow in a person it brings out the worst outcomes and makes people rigid! If we really want the new paradigm to emerge we need to live from the heart space at every moment and love each other! As the media began inquiring about the overseas travel habits of Nationals backbencher George Christensen, General Campbell decided it was time to stage a strategic intervention. “Oh Angus,” Minister Pyne exclaimed with surprise as the imposing soldier tapped him on the back. “My apologies,” the General whispered, in full view of the assembled cameras and microphones. “I might just ask that the military officers step aside while you’re answering these kind of questions. “Yeah sure, please do,” the Defence Minister agreed, excusing the top brass from their awkward nodding duties behind him. A senior military official told the ABC the incident was a “timely reminder” for politicians not to attempt to use ADF personnel as props in an election year. That was certainly a positive demonstration of apolitical military proffesionalism by General Cambell, and may be, as you suggest, a positive sign of change in the wind. Ps, I also enjoyed the obviously grateful smile and handshake that the Air Force boffin offered after Gen Campbell’s intervention. Good to see our Spooks coming out of the cold to support a change of government by becoming even-handed. Change must come when so many resources are being allocated. More public information about the role of our intelligence agencies in justified to protect their professionals from the one-sided scare tactics which the LNP uses in their name. Tony Abbott told us that the Japanese were our best friends in Asia. The British assisted in building up the Japanese Navy in the 1920s and Menzies sold off out spare pig iron despite protests from the left-leaning WWF. In the same month that Menzies made his first political radio broadcasts to topple the Curtin Government, midget submarines caused havoc in Sydney Harbour. Up in Darwin in February 1941, the squadrons on Japanese planes were initially thought to be US allies. Can we trust the current minister’s ministerial guidelines? Time to change bad practices with the goodwill of ASIO Professionals. Let’s check next weeks budget to tally the resource allocation to AGO, ASIS, ASIO, DIO and ONA who all get a mention in Denis’ article: How much change will there be out of $3-4 billion I ask because I do not have easy access to all the annual reports so of which are not listed on the Parliamentary Site used for this article. And there is also IGIS (Inspector General of Intelligence and Security) plus other behind the scene units operating within AUSMIN.